Ramen Jiro, established in 1968, has seen better days. This narrow sliver of a corner site in Mita opened to attract students from nearby Keio University, but these days it’s just as likely to feed stout working men who don’t mind the queues and grimy and unloved interior of scuffed surfaces. Portion sizes are manly, macho even, as the smallest ‘sukoshi’ size is still bigger than your head; the large size would be enough to feed a Studio Ghibli monster. 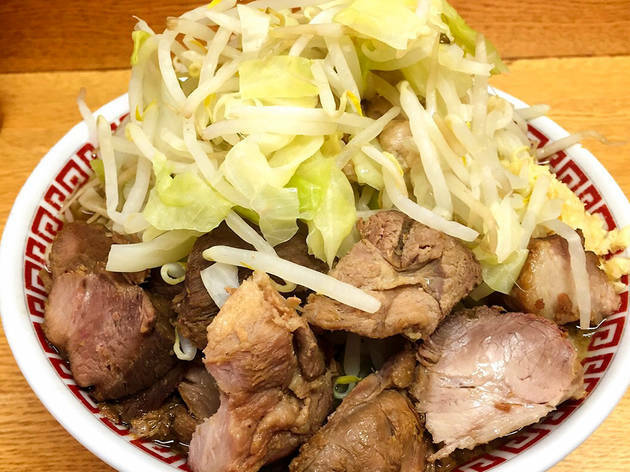 The faithful return because this original Ramen Jiro kickstarted a dish trend that came to be known as, well, ramen jiro – and all of Tokyo’s other thirty-plus ramen jiros are descended from it in some way. The bread flour noodles are coarser than usual for ramen, both in diameter and uniformity; the pork stock is fatty, but still much lighter than, for example, a Fukuoka-style tonkotsu broth. 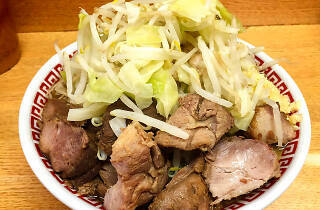 Huge chunks of pork form the topping, with lashings of cabbage, moyashi (bean sprouts) and enough garlic to keep the entire cast of ‘Twilight’ at bay. It’s not a sophisticated dish, and neither is this original setting with its wipe-clean red formica counter, narrow row of bar stools and antique meal ticket vending machine – but that’s why regulars love it.